Happy Bloggers Challenge Friday! Thanks to those who played along with last weeks Color Splash Challenge, this weeks challenge is to use Pattern Papers (use two or more). My card uses the Starburst Technique, the papers are from Our Daily Bread Designs Heart and Soul Paper Collection. I used four different patterns from the paper collection, cutting my pieces at 1-1/2" x 4", then cut them on a diagonal and sponged the edges before adhering to the White base layer. The sentiment is from the ODBD Love You Bunches stamp set, stamped in Chocolate on a White panel then die cut using Spellbinders Circle Dies. To embellish my card, I added the ODBD Beautiful Borders Die in Espresso, Vintage Brown Seam Binding, Zva Creative Mini Roses, and leaves and flourishes die cut from Olive card stock using Our Daily Bread Designs Fancy Foliage Die. If you'd like to play along with this weeks Bloggers Challenge, please link back to this post on your blog and mention you created your card for the Bloggers Challenge Pattern Paper Challenge. Please add your link using the Link Tool below, your link should be a direct link to your Bloggers Challenge Post, use your name as the Title. Please do not link to cards that were created prior to the challenge date. Entries not linking properly, or backlinked will be removed. If you have the captcha enabled on your blog, please consider turning it off, as it makes it so much easier to leave comments. Beautiful! Love the combination of patterned papers you used. This is awesome Lisa! LOVE the design, I'll have to give that a whirl! Hope to play along ... thanks for the fun & inspiration! Hi; I'm a newbie so if I made it all wrong please feel free to tell me! I'm also a new follower! Beautiful design, papers and finished card! xxoo Happy VD! Oh, Lisa, what a fabulous card! I just LOVE how you've used the Starburst Technique, especially with the ODBD papers! It's fabulous! And the black matting of the sentiment and the black border really showcases the flowers and fancy foliage! It's gorgeous! You are amazing, and we are blessed you are supporting this week's ODBD Shining the Light challenge, sweet friend! Warm hugs! Great card, love the design of it and that sentiment is just perfect!! 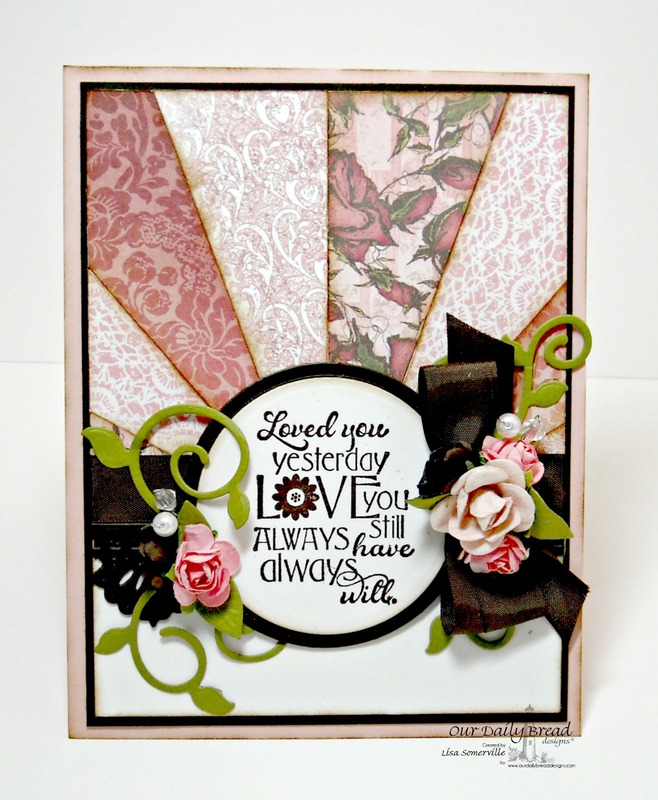 Love the paper-pieced rays - so pretty! What a beautiful card!! I just love your paper pieced sun rays and the black matting!! So elegant!! Great flowers and details. Thanks for supporting the ODBD Shining the Light challenge this week. Your card is gorgeous!! I love that you sponged the edges.. just makes it pop. Love the black in this card too. Just GORGEOUS!! Thanks for the fantastic challenge! !